Bryony Frost made history aboard Frodon as she became the first female jockey to ride a top-level Grade One Cheltenham Festival winner over jumps on an extraordinary day, which was called "one of the most significant in the meeting's recent history". 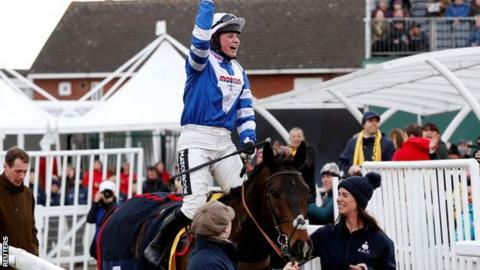 Frost, 23, wiped away tears while a rapturous crowd of nearly 70,000 saluted her dramatic victory in the Ryanair Chase. "He's got his day, he's Pegasus," she said of the 9-2 winner - trained by Paul Nicholls - before more emotional scenes followed at the track. Lizzie Kelly chalked up another triumph for the women on Siruh Du Lac, while Paisley Park landed the Stayers' Hurdle for his blind owner Andrew Gemmell. Frost, who started riding aged two on a donkey called Nosey, punched the air and sported a wide smile after securing the most high-profile victory by a female rider at the showpiece meeting. "He has wings and he is the most incredible battler. He travelled, and by God he jumps," said the Devon-born jockey after finishing ahead of 33-1 outsider Asos and Road To Respect (9-2). Ten-time champion trainer Paul Nicholls, who has saddled racing greats such as Kauto Star and Denman, called it "one of the best days ever". A buoyant crowd at the Gloucestershire course roared their approval again in the following race as favourite Paisley Park survived a final-flight scare to seal victory for jockey Aidan Coleman and trainer Emma Lavelle. Delighted owner Gemmell, 66, has never seen a racehorse but has put his disability behind him to travel the world and follow sporting events via radio commentaries and help from friends. Carrying his white stick, and wearing a donated claret football scarf, the West Ham fan was helped to the winner's podium by friend Tom Friel, the landlord of the Black Lion pub in East London where Hammers' 1966 World Cup winners Bobby Moore and Sir Geoff Hurst used to drink. This has the ability to be one of the most significant days in the recent history of the Festival. The amount of times people say to me 'oh, horse racing is so old-fashioned, it's all men, all middle-class and really dull'. The fact is, racing has a lot to be confident and on the front foot about, particularly in terms of female participants who weren't even allowed to be part of it until the late 1960s. Bryony Frost guiding Frodon to victory, then 45 minutes later Emma Lavelle being the trainer of Paisley Park, and then Lizzie Kelly goes and rides a winner. These are really significant results. It is really important in a world where other sports are so much more powerful that racing has had a headline-grabbing day. Bryony has everything that's required to be a star in the wider modern sporting world: consummate skills, obviously, but also a communication ability to match - to say the irrepressible Frost has both in bundles doesn't entirely do her justice. There is no doubt that this talented, interesting, bubbly character - the crowds adore her - is a classic poster-person and role model about whom more and more people are sure to be hearing. Frost and Frodon have built a perfect partnership over the last two seasons and they were smoothly into their rhythm at the front from the start of the race over two miles and five furlongs. The seven-year-old gelding had been considered for a tilt at the longer Cheltenham Gold Cup on Friday, but it was felt he would be better suited by this contest on rain-softened ground, and he relished the trip. Sub Lieutenant and Road To Respect vied for the lead at one stage, but it was only 33-1 outsider Aso, ridden by Charlie Deutsch for trainer Venetia Williams, who could stay with the leader before having to settle for second. Frost, who was landing her second Grade One win after victory in the Kauto Star Novices' Chase at Kempton in December on Black Corton, said: "He's the most incredible battler! "He travelled, my God he jumped, and the moment he got overtaken two out, most horses would have quit. He grabbed me by the hands and said don't you dare give up. He's unbelievable. "He deserves every single high five, pat and carrot." Frost is one of a new generation of female jockeys making their mark in a sport where women often compete against men on equal terms. Kelly, who became the first female jockey to win a Grade One jumps race in Britain in December 2015, is another. And she joined Frost on the 2019 roll of honour later on Thursday when Siruh Du Lac claimed the Grade Three handicap chase. The 9-2 chance had to battle all the way to the line to hold off the challenge of favourite Janika. Thursday's double followed Tuesday's first Festival success for Rachael Blackmore - who is bidding to become the first female champion jockey in Ireland - on A Plus Tard. Frost has bounced back after suffering serious injuries in a fall last year which ruled her out for three months. She was joined by her family for the celebrations on Thursday, including brother Hadden who flew back from the US for the race. "Incredible, so proud of her. She and the horse did not miss a beat out there," said her father Jimmy. "We walked the course this morning together and she took it all in, as she showed in the race." In a pre-Festival column for BBC Sport, Frost described her partnership with Frodon, a Cheltenham specialist who has won five times at the Gloucestershire track. "He's numb in his braveness. He's more competitive and braver than I am. He wants it. He knows his races and courses so well," she said. "If he was a kid who went to school, he would definitely come out with A stars. "When he was younger, he was quite bullish and a know-it-all. This year, we have really clicked, we have just found this wave we are riding on together. "I know for a fact he will offer me 100% of himself, and I will give it right back. 'Frod' is the man. It's a privilege to be with him."